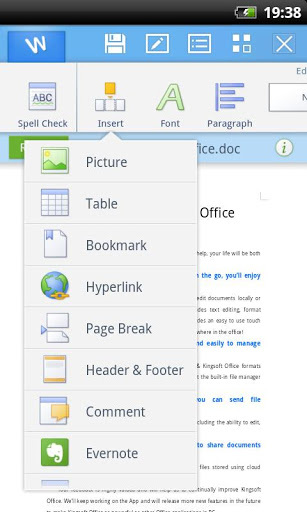 Kingsoft Office is free and best office application for android operating system you can find in the market. If it is small mobile screen or big screen like tablet app works like a charm. It will give the rich editing feature. It support 23 kinds of file including you can view and edit favorite MS Office 2010 document like DOC, DOCX, XLS, XLSX, PPT, PPTX files. It’s easy to use, built-in file manager of its own offers create and delete supports. Support cloud storages such as Google Drive, Dropbox, Box.net etc. You can save the file in SD card, it has tight integration with email client. Export word DOC to PDF format is built in feature. Spell check is enabled. Directly insert the It will support old android version like android 2.1 and above. 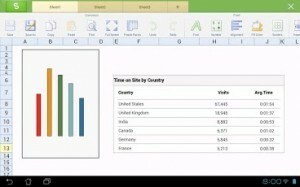 It is one of the best free must to have office app for android.